I have two friends who cheat at every game they play. We've tried all the typical routes to help them understand why it's not okay to cheat. Nothing was working until I made them play each other. THEY HATED IT. Constant tattling, constant clashing, constant strife. Me: "How do you feel?" You have read over and over again about how my fabulous co-teachers and I use Google Docs during Writing Workshop. Well, here's the next phase. We were able to go through our anecdotal notes on every student and make groups based on their needs. 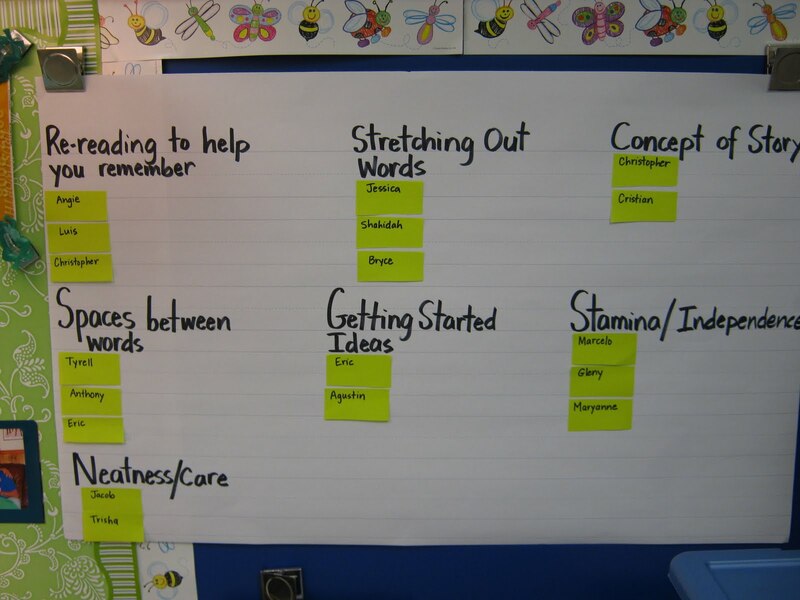 This isn't revolutionary, but what's great about it is that we as teachers now have a crystal clear picture of what each child needs in writing. If you teach writing to kinders, you know this can be difficult. Turns out we have about three kids in each group that need to focus on one aspect of writing. The brilliance? My co-teacher suggested we make a chart and then use post-its so we can move the kids around where needed. No need to flip through notes or scroll through tabs, we just glance on the wall. Management nirvana! So now after the focus lesson, each teacher looks at the chart and decides what group to work with. Is this rocket science or mind-blowing? No. But it is awesome. January 3rd - April 15th without a break. Are the people in charge of making our calendar laughing an evil laugh right now? I grew up in New York State. We had a week long winter break in February, a spring break in April, and as far as I can remember, we didn't go to school until July. 17 more school days until spring break... I think I might put a countdown ticker on my iGoogle.